Fossils with a history dating back to as much as 7.5 million years are now being displayed at an exhibition in central Turkey's Kayseri province. 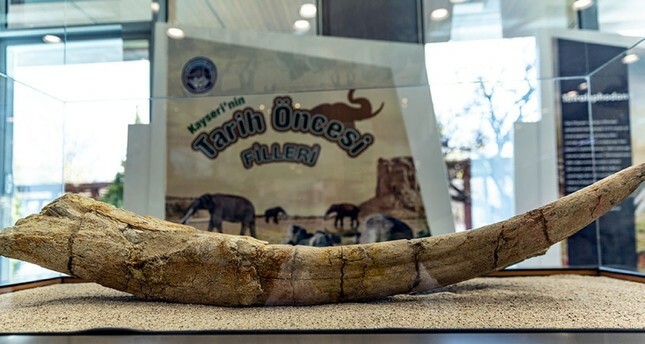 The exhibition titled "Pre-historic elephants of Kayseri" showcases remnants of animals including elephants, three-toed horses, giraffes, rhinoceri and other horned species from the late Miocene period. Speaking at the opening of the exhibition on Monday, Provincial Mayor Mustafa Çelik said that the traces of the past are carried into the future thanks to the exhibition. The fossils were discovered last year by a goat herder who lived near the Yamula Dam in Kayseri, and excavations were launched from then on. "Those excavations continued in different areas," said Çelik, adding that the fossils were unearthed completely after about three months of excavation works and became ready for display after three months of laboratory studies. Çelik said that among the fossils belonging to elephants there are some well-preserved examples that have been seen in world literature for the first time.